Calendar — National Association of Black Accountants, Inc.
Join us for the 4th annual celebration of Women in Leadership! We are excited for another year of engaging conversation with our distinguished set of panelists from across the commercial and entrepreneurial sectors. The panelist discussion will center around Owning Your Worth, particularly overcoming challenges of gender and ethnic inequality, asking for what you have deserved and more. The discussion will also touch upon elevating your voice, brand, and network to achieve new heights both inside and outside of the workplace! This is an event you are not going to want to miss! 32ND ANNUAL SCHOLARSHIP & AWARDS GALA. We welcome you to the 32nd Annual Scholarship & Awards Gala themed, 'Insights to Excellence'! NABA was formed to address the professional needs of its members and to build leaders that shape the future of the accounting and finance professions with a commitment to inspire the same in our successors. As part of this mission, the scholarship and awards gala is an opportunity to recognize students majoring in the accounting, finance and other business fields. For 32 years, NABA Seattle has celebrated the academic achievements of students; awarding over $160K in student scholarships to exceptional minority students in the state of Washington. Please join us at the Museum of History and Industry (MOHAI) on May 18th for a fun filled night of celebrating our future business leaders! Click here for last year's promo clip; We look forward to seeing you there! Registration is required (link below). NABA Seattle will be partnering with Dignity for Divas for a volunteer event April 20th from 11Am-1PM. Dignity for Divas provides essential care packages to women experiencing homelessness which helps them restore their dignity, reminds them that they matter, and reconnects them with their inner diva. This puts them in a better position, both emotionally and mentally, to successfully transition out of homelessness. At our event we will be assembling care packages that will be distributed to homeless women in need. Children are allowed to participate but must be accompanied with a parent or guardian. The parent must stay with their children the entire event. The age limit is age 7 years old for bagging events. All parents must also sign a liability waiver for their children and photo release form. We will also need to know of any allergies their child may have. Street parking available off 23rd ave, 24th ave and Main st.
Click the RSVP link is below to join us in contributing to our community. The NABA Western Region Student Conference (WRSC) provides opportunities for future leaders! Our students from the University of Washington Student Chapter will head down to Dallas for networking, professional development workshops, internship and career opportunities, and fellowship with other students from the Western Region. The 2018 NABA National Convention and Expo will take place in Orlando, Florida at the Orlando World Center Marriott from June 13 - 17. The annual convention brings together over 2,000 members, employers and students for an eventful week of workshops, career expo, CPE cessions and fellowship! This year's theme is iVOLUTION; Take risks. Leverage resources. Seize control. As active members of NABA, most employers will sponsor your attendance to the convention, please contact us at naba.seattle@live.com for more information and click here for more details on convention schedule, location and registration. 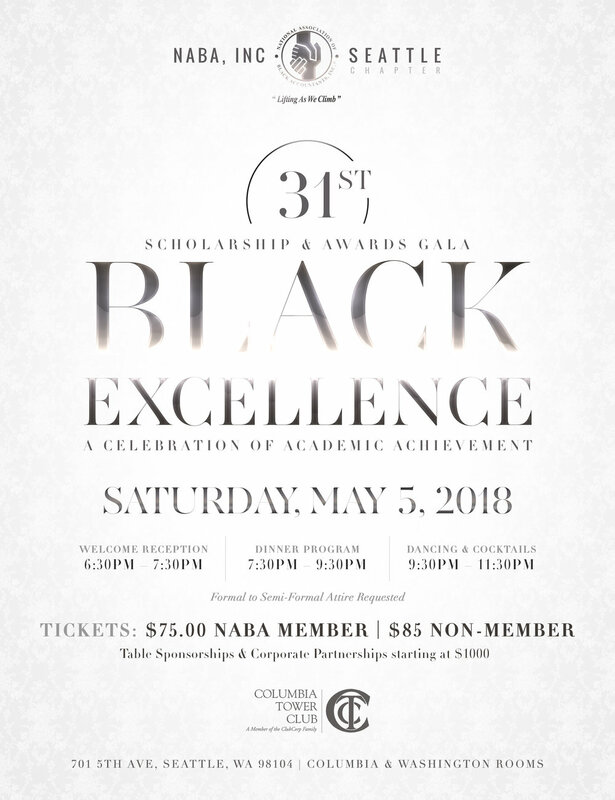 NABA Seattle welcomes you to the 31st Annual Scholarship & Awards Gala. The title and theme for this year's event is “Black Excellence: A Celebration of Academic Achievement”. NABA was formed to address the professional needs of its members and to build leaders that shape the future of the accounting and finance professions with a commitment to inspire the same in our successors. As part of this mission, the scholarship and awards gala is an opportunity to recognize students majoring in the accounting, finance and other business fields. For 31 years, NABA Seattle has celebrated the academic achievements of students; awarding over $150K in student scholarships to exceptional minority students in the state of Washington. Your support of passionate, innovative and enterprising individuals is a message we want to share with our future business leaders. Please join us at the Columbia Tower Club on May 5th for a fun filled night of celebration! 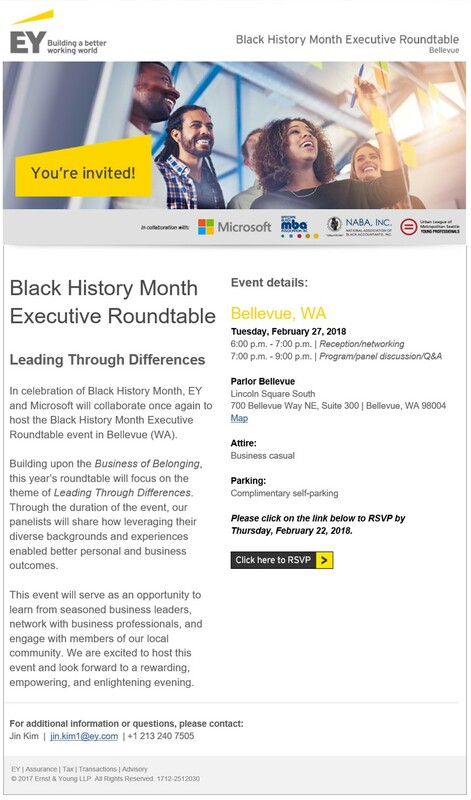 NABA Seattle is proud to be a returning partner of the annual Black History Month Executive Roundtable hosted by EY and Microsoft. RSVP HERE! 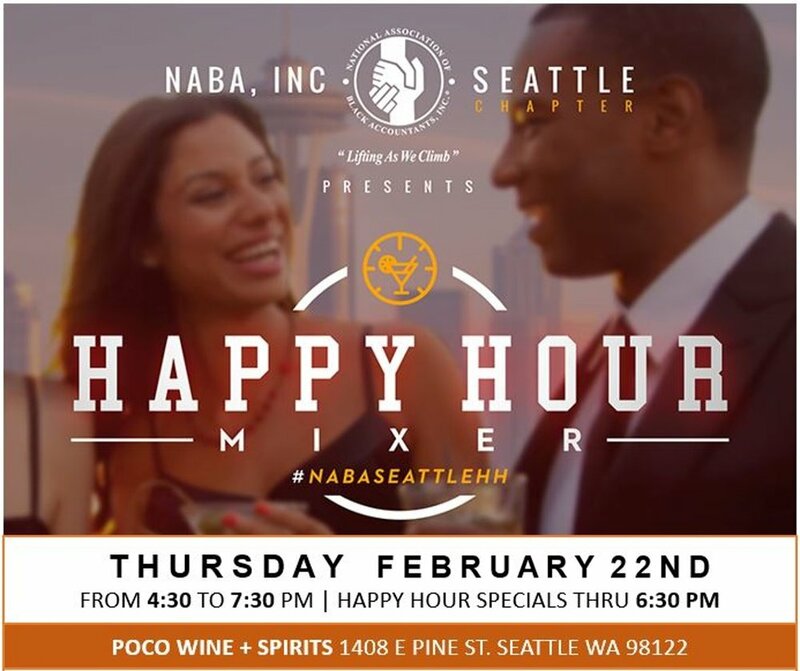 Join us for the February edition of our monthly happy hour mixers on last Thursdays! We are back at POCO Wine + Spirits, which is Black owned. Join us for networking, drinks and great vibes! Join us to kickoff monthly happy hour mixers on last Thursdays! The kickoff location, POCO Wine + Spirits, is Black owned. Welcome to the 46th Annual NABA Convention & Expo! The 2017 convention will be held June 6-10, 2017 in New Orleans, Louisiana. New Orleans provides the perfect backdrop for a week of high-energy networking, relationship building, learning and recognizing individuals who have contributed to NABA's success and history. Join more than 2,000 members, partners and guests in the “Crescent City” at the Hilton New Orleans Riverside as we explore the convention theme, “DARE to LEAD”. Kick back and join us for drinks as we prepare to attend the NABA Annual Convention in New Orleans! Learn about convention activities hosted by Seattle area companies (Amazon, Boeing, Microsoft & more) and join our "NABA Convention Seattle Folks" GroupMe for communication and meetups throughout the convention. All Seattle professionals are welcome! Last year the Seattle Chapter of the National Association of Black Accountants partnered with the Seattle Urban League Young Professionals (SULYP) to host the Women in Leadership panel discussion and we are back this year! Join us for the 2nd annual celebration of Women in Leadership as we are excited to hear from another set of dynamic leaders! From corporate, entrepreneurship to public sector, the panel discussion will center around rising to the occasion, particularly when faced with both opportunities and challenges throughout your career and personal life, while remaining your authentic self. The discussion will also include building self awareness and transforming from individual contributor to people manager.. Additionally, panelists will share personal insights for navigating your career as black professionals. Learn, get inspired and network with Seattle area professionals. 2016 NABA National Convention & Expo! The NABA National Convention & Expo brings together nearly 2,000 participants from across the country from multiple disciplines in the industry. You do not want to miss this gathering of accounting, finance and business professionals and the opportunity to learn best practices from your colleagues. The 2016 National Convention & Expo will showcase cutting edge and timely topics impacting accounting and finance professionals in the marketplace and workplace, as well as provide opportunities to connect with subject matter experts for the exchange of ideas. Hear the latest trends from the top corporate industry leaders, agencies and key organizations such as the “Big 4”, AICPA, State Street, and many more! The 2016 education tracks have something for everyone and will offer a wide arrange of session to reach professionals in every segment of the field – accounting, finance, audit, ethics, information technology, consulting, and tax. In addition to extensive learning opportunities with over 40 educational sessions to choose from and an opportunity to earn at least 18 hours of CPE credits. The Boeing Company’s Corporate Audit organization is pleased to offer yet another unique professional development and networking opportunity on April 21, 2016 in Seattle. This year’s event will focus on training and development of mid-career, finance and accounting and auditing professionals. Details are provided below. Contact Victoria L. Johnson at Victoria.L.Johnson@boeing.com and provide the following information: name, phone number, and contact email. Professional affinity groups (ALPFA, NABA, ASCEND) will provide information on their organizations and how they can foster career development and networking support. Cost is free and includes admission to The Museum of Flight before or after the event. EY will host its annual Elements of Success Program at the University of Washington Foster Business School (Paccar Hall Room 290) on Thursday, September 24th and we are asking for volunteers to network with students, deliver presentations and assist with mock interviews. The purpose of the Elements of Success Program is to expose diverse students to a professional services firm like EY and prepare them for career fairs, leadership conferences/interviews and club presentations. The half day will consist of presentations discussing the do’s and don’ts of dressing, interviewing, networking, communications styles and resume writing. Immediately following the presentations, networking receptions and/or real-time feedback will be provided to the student participants. The areas where we will really need NABA volunteers is the Resume building workshop/reviews and the Mock Interviews. The more time we can get volunteers to attend the better but we understand you are busy, so we are asking for these as the most important items. Please sign up to volunteer and indicate your selected event/time preference for participation in the recruiting schedule below via e-mail to Andre Gill-McVey at andre.gillmcvey@ey.com by September 11. For any questions regarding this event, please contact Andre Gill-McVey at andre.gillmcvey@ey.com or call (206) 310-2739. Join the NABA & ALPFA for a pre-game social and soccer match on August 1st!!! Chapter leaders and members are invited to join this year's planning retreat on Saturday, June 27, 2015. Bring your ideas and let's get to work! The 2015 Annual NABA National Convention will be held in the Western Region. As part of this mission, we host an annual scholarship banquet to recognize budding high school and college students interested in accounting, finance and business. Our theme for the banquet, “Connect. Collaborate. Cultivate. Bridging the Generational Divide,” is in tandem with NABA’s national objectives for the year.